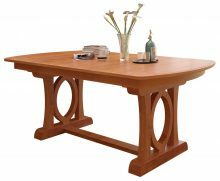 Our solid wood Double Pedestal Tables enable you to easily adjust the size of the tabletop by adding or removing leaves. They’re perfect for any homeowner who frequently hosts dinner parties or large family gatherings. Choose from dozens of gorgeous tables, many featuring the ever-popular Shaker and Mission furniture design styles that have been fixtures in American homes for more than a century. These simple, yet elegant, styles fit nicely with just about any dining room décor. The dining table has long been the centerpiece of American homes. From regular weekday dinners to large gatherings and celebrations, it’s important to take the time to slow down and enjoy a delicious meal in the company of your family and friends. This is even more important today, when our lives seem so busy and rushed. Dinner time around the table gives you time to learn about how everyone spent their day, and what important things are happening in their lives. 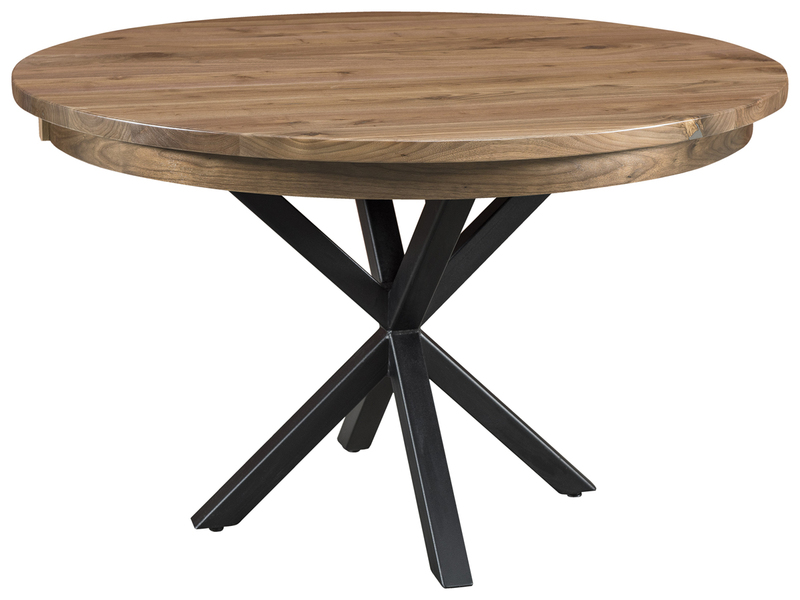 A solid wood Amish pedestal table is a particularly enjoyable place to dine. The solid, durable construction can handle even the biggest, boisterous meals, and your beautiful table will be a conversation piece. Whether it’s a small gathering around the regular-sized table or a large party with all of the leaves extended, everyone will admire the timeless design, natural grain, and elegant stain finish. Pedestal tables are not only attractive, they’re also very practical. They don’t have legs at the corners, so they allow for maximum seating all the way around. They’re perfect with benches, for including more hungry visitors. And because of the many different styles and designs we offer, you can fit one of our Amish Outlet pedestal tables into any type of décor. Traditional, contemporary, minimalist — all types of dining rooms look great with solid hardwood. You can either choose matching chairs from our vast collection to complete a set look, or mix and match random chairs for a fun, playful result. 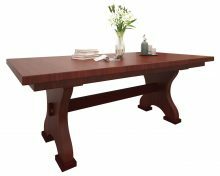 Like every product in our extensive Amish dining table collection, Double Pedestal Tables are made from the finest northern kiln-dried hardwoods such as oak, cherry, maple, hickory and others. These strong, sturdy materials are known for their remarkable durability, which is why so many of our furniture pieces become loved heirlooms that are passed down from one generation to the next. And the time-tested Amish craftsmanship ensures your table is made with care and a close attention to every detail. You’ll also be pleased to know that your pedestal table was made right here in the US, by hardworking Amish artisans. They don’t work in high-pressure factories, pumping out forgettable table after forgettable table. 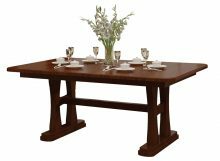 They put real care and attention into the very table you customize right here on our site. You can’t say that about mass-produced furniture coming off an assembly line halfway around the world. Every time you sit down to enjoy a meal with your family, you’ll be reminded that true craftsmen applied generations of knowledge and know-how into turning Northern hardwood into the masterpiece in front of you. You Always Get Great Value for Your Money at AmishOutletStore.com! Your hard-earned dollar goes a long way at AmishOutletStore.com. Purchase any table from our collection today and get up to 33% off the regular retail price! We also provide a discount for large orders and paying for your furniture by check. Attractive Amish-made furniture at discounted prices is something that any homeowner can appreciate. Start by browsing our wonderful pedestal table collections. Measure your dining room and get a feel for the size of table you need. Remember that our pedestal tables can be extended, and extra leaves can give you more space for special occasions. You’ll want to invite everyone you know for dinner, so you can share your Amish pedestal table. Once you’ve chosen your table, you select the wood. What’s your preference? Oak? Maple? Cherry? It’s your choice! Once you’ve customized your table, you might want to select some of our great benches or chairs to go with it. Then simply place your order and our Amish artisans will start building your double pedestal table. Check out our huge inventory of handcrafted solid wood Double Pedestal Tables and order yours today!